A few of my blog buddies are celebrating too....Suzy, a sweet Southern gal originally from Louisiana, is hosting our little party.. They were good, but I don't know I'd make them again with chocolate for breakfast. The last time I made them I used a recipe Carol gave me, and used apples , and we liked them better. Thanks for coming to the party...Hope you got the baby in your piece of King Cake! Wooohooo..I must have had esp and came online at the right time to check out the blogs to see who else had come to the party. First I caught Susan's and now your's. I just love your Mardi Gras table and the harlequin napkins are so cool. I need those! 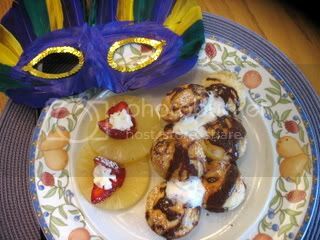 I'm so glad you brought in more Mardi Gras/Shrove Tuesday traditions in your post. Your abelskivers look delicious. I would love to hear this word pronounced because I am sure I am butchering it in my head! Thanks so much Kathleen for coming to the party. I can't wait til St. Patty's day! It looks like I'm the only one not celebrating Mardi Gras this year. 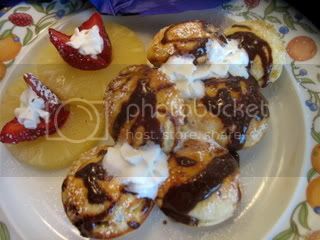 Kathleen, even if I can't pronounce Abelskivers, yours certainly make me want to dive into the last three mouthwatering images! 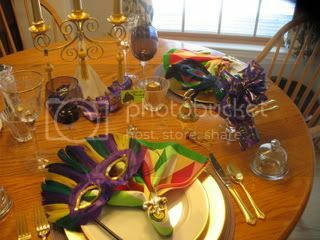 Kathleen, why am I not surprised that you have a gorgeous tablescape for Mardi Gras... festive napkins, fleur-de-lis napkin rings, masks, lots of gold. 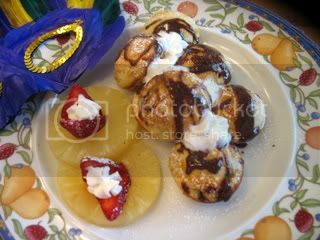 The abelskivers look very appealing and the strawberries opened up with whipped cream are so cute. I'm not surprised that you liked the apple abelskivers better than the chocolate ones. As much as I love chocolate, I'm not a fan of it for breakfast. Such a festive table setting, Kathleen! You even have the fleur de lis there, I see. The chocolate in your abelskivers may have been too much for breakfast but I'll bet they would taste great for dessert! You're all decorated for the next party alreaady ;) It won't be long. I normally do a mardis gras table but didn't this year. Love your's Kathleen...those masks are great! 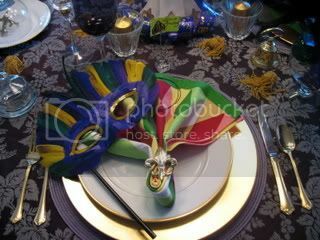 What a beautiful tablesetting, the napkins are perfect for Madri Gras. Your tables are always the best. The abelskivers are perfection and there is nothing wrong with chocolate for breakfast as long as fruit is on the side. I'd love to come to the St. Pat's day party. But just pencil me in for now. But if I'm in town, I wouldn't miss it! Thanks for the invite!! 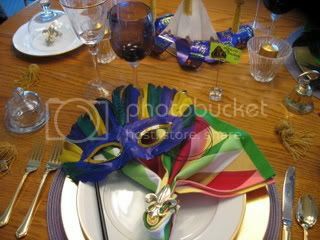 What great place settings and yummy Mardi Gras treats! Kathleen, I knew you would have a great table! Love your decor! I thought about pancakes this morning, but had my oatmeal instead. The abelskivers look good and the fruit... cute berries w/ the whipped cream. Yes, that could make a good dessert! This has been a fun party! Nice tablescape as always, Kathleen! Kathleen - love your table...I used to have some masks years ago..but long gone now! Kathleen, it's all in the presentation for me! Your table and the harlequin napkins are wonderful. Quite a few of the churches in my area celebrated Shrove Tuesday with pancake dinners. I can't wait til St. Patty's day! 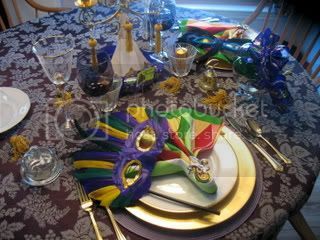 Love the Mardi Gras table...gorgeous colors! I've got an award for you and it's in my Brown Bubble Frosting post. You can pick it up any time.